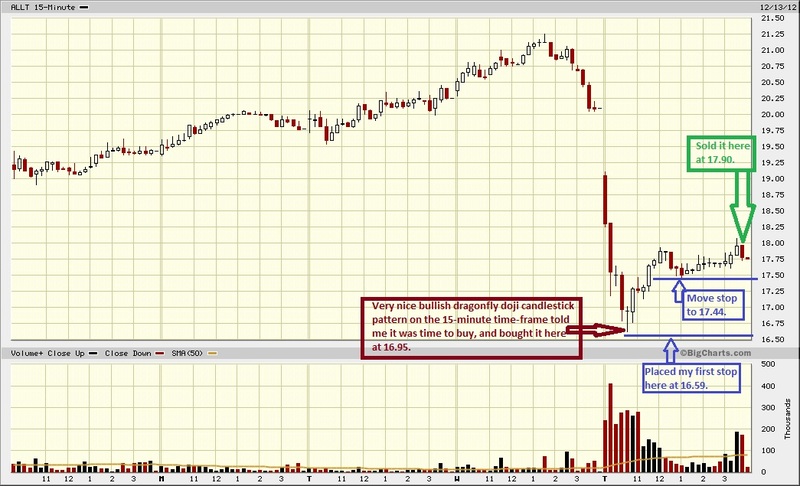 TRADER 9: Trade of the day, ALLT!!! ALLT today on the 15-minute candlestick bar chart formed a very nice bullish dragonfly doji candle. When you see that form anywhere on a chart with at least 2 long red bearsih candles prior to it, that means the downtrend is losing momentum and bulls may more than likely retake the stock soon. So I decided to go long 500 shares at 16.95 and hold it as long as I can before the close. It ended up working out pretty well, and sold it at 17.90 for a .95 point gain. My risk to reward ratio was only 1:2, but the probability was very high for a bounce. Plus, I made a huge killing on a quick day-trade on ATC and got out before it got halted, but I don't really like to post those type of trades because that's not a real Dead Cat Bounce play. Nice trade Mike. I profited on that bounce also.